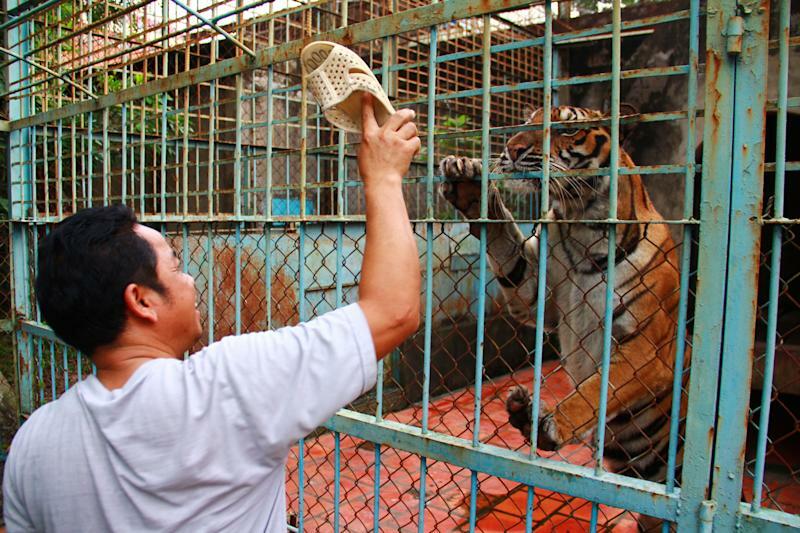 AN BINH, Vietnam (AP) -- Nineteen tigers prowl outdoor cages the size of dormitory rooms, nibbling frayed wire fences and roaring at a caretaker who taunts them with his sandal. It looks like a zoo, but it's closed to the public. The facility breeds tigers, but has never supplied a conservation program with any animals nor sold any to zoos. Conservationists allege that Vietnam's 11 registered tiger farms, including this one, are fronts for a thriving illegal market in tiger parts, highly prized for purported — if unproven — medicinal qualities. Nonsense, says manager Luong Thien Dan. He says the farm in southern Binh Duong province was created simply because its management has a "soft spot" for the big cats, and that it's funded privately by a beer company. The conservation group WWF this week ranked Vietnam as the worst country for wildlife crime in its first such survey of how well 23 countries in Asia and Africa protect rhinos, tigers and elephants. The Switzerland-based group focused its report released Monday on countries where the threatened animals live in the wild or are traded or consumed. Vietnam's foreign ministry did not immediately respond to a written request for comment on the WWF report. But in Asia, such farms are largely unregulated and create "an avenue for trade in something that you shouldn't be trading in," said Vincent Nijman, a wildlife trade expert at Oxford Brookes University in England. Vietnam is now being accused of becoming a key driver of an illegal trade that spans continents. Advocacy groups say the government's support for captive wildlife facilities — especially tiger farms — suggests that although it professes wildlife conservation, it actually is helping to drive threatened animals toward extinction. China, which the Washington-based Brookings Institution calls the "world's largest market for illegal trade in wildlife," finished the second worst in WWF's ranking, but received praise for recent efforts to police the illegal trade in ivory and tiger products. In 2010, Chinese authorities required the country's two largest tiger farms to place microchips in live tigers and keep track of the carcasses of animals that die. In neighboring Vietnam, however, the prime minister's decision in 2007 to legalize tiger breeding farms on a pilot basis has "undermined" the government's wildlife enforcement efforts, the WWF wildlife crime report said. It added that captive tigers now appear to be a "substantial proportion" of the world's illegal tiger trade. Tiger bone paste — which some Vietnamese say is an effective pain killer — can fetch a few hundred dollars per ounce ($1,000 per 100 grams) on the black market. The 35-page WWF report comes on the heels of a controversy in May, when international environmental officials and wildlife advocates learned that Vietnam's agriculture ministry had proposed allowing parts of tigers that die in captivity to be made into traditional medicine on a pilot basis. An official at the ministry, Do Quang Tung, denied critics' charges that the proposal was designed to effectively legalize trade in tiger products, and an official at Prime Minister Nguyen Tan Dung's office told the AP earlier this month that Dung had rejected the proposal. Wildlife advocates say Vietnam's tiger farms have high mortality rates and cannot possibly sustain their reported populations without sourcing smuggled tigers, which they say often enter the country via its mountainous border with Laos — a country ranked the third worst offender on WWF's wildlife crime report. According to Vietnam's Ministry of Agriculture and Rural Development, 49 of the 112 tigers living on the 11 registered tiger farms were born in captivity. He told the AP that he couldn't recall how his farm acquired its first cubs, nor how many tigers have died since the farm opened. Dan says the farm covers expenses — raw meat runs about 150 to 200 million dong ($7,200 to $9,600) per month — with profits that his cousin, Ngo Duy Tan, earns as a beer keg manufacturer. The rusty tiger cages sit on Pacific Beer Company's 7,000 square meter (75,000 square foot) property, across a parking lot from silver brewing tanks and a giant pile of malt. Farm management hopes to open an ecotourism park to showcase its tigers, but Dan said the farm's future is uncertain because it has only a temporary permit from the prime minister. Dan said he would welcome a government move to legalize the selling of tiger parts for use in traditional medicine.